ISRO has announced via Facebook that the next burn to raise the earth orbit (apogee) to close to 200,000 km will be carried out at 0127 IST (2057 CET 15th November). If this goes as planned the next manoeuver is expected to be to inject the probe into a Trans-Mars trajectory on 1st December. 2130 CET: Just reported to have been successfully completed “The observed change in Apogee is from 118642 km to 192874 km”. 2045 CET Forward rotation to prepare for burn completed. Craft at perigee. Awaiting post burn report. The fifth orbit raising manoeuvre of Mars Orbiter Spacecraft, starting at 01:27:00 hrs (IST) on Nov 16, 2013, with a burn Time of 243.5 seconds has been successfully completed.The observed change in Apogee is from 118642km to 192874km. Tonight is going to be the culmination of the various baby steps MOM has been taking by gradually soaring to higher apogees around Mother Earth. This manoeuver, scheduled at 01:27 hrs IST, will take the spacecraft to – almost half the way to moon – about two lakh (200,000) kilometers. The distance to the moon is 384,400 km (and I make 200,000 to be a little more than half-way)! At this distance Deep Space Tracking will become necessary. The Indian Deep Space Network consists of a 18-m and a 32-m antennae that are established at the IDSN campus, Byalalu, Bangalore. The Network is augmented with a couple of stations in the western hemisphere in addition to the 64-m antenna in Bearslake, Russia to improve the visibility duration and to provide support from the antipodal point. ….. External network stations APL, JPL (Goldstone, Canberra, Madrid), Hawaii, Brazil (Alcantara, Cuiaba) are requisitioned in for the purpose of extended visibility of Launch and Early Orbit Phase (LEOP) operations, as well as to gain the near continuous visibility during the normal phase operations. All the external stations will ensure the required compatibility to communicate with the spacecraft. 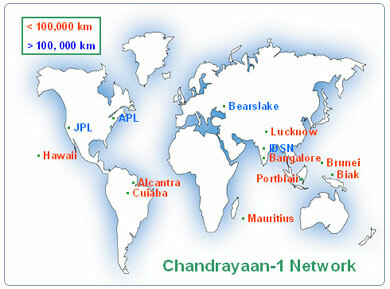 The network as used for Chandrayaan and expected to be used for Mangalyaan is shown below. This entry was posted on November 15, 2013 at 7:20 pm and is filed under Engineering, India, Space, Technology. You can follow any responses to this entry through the RSS 2.0 feed. Both comments and pings are currently closed.